Firstly, you may find it useful to read the two preceding articles to this, so as to get the full picture: Lasers in Light Wind and Lasers in Medium Wind. You can easily have days or even weeks when the wind is consistently strong, but there will likely be changes—medium wind increasing to strong wind as the sea breeze strengthens, or strong decreasing to medium as it weakens. So, this requires a change in technique. If medium winds are about keeping power, then strong winds are about losing it. Too much power causes the boat to heel, which will make you go sideways upwind, as well as slow you down because you need to constantly pull the tiller toward you to keep the boat going in a straight line. This “corrective steering,” caused by the “weather helm” creates a lot of drag. So, remember flat is fast, even if it is not possible to keep the boat dead flat. Although, the most important thing is perhaps a constant angle of heel. A constant 3-degree heel is much better than a boat constantly moving between 0 and 6 degrees because both the foils and sail will have better flow over them. And of course, it is easier to steer accurately to the waves with constant rudder pressure. When we are talking about losing power in the rig we are referring to upwind. Downwind we are still looking for power to surf or even overtake the waves. 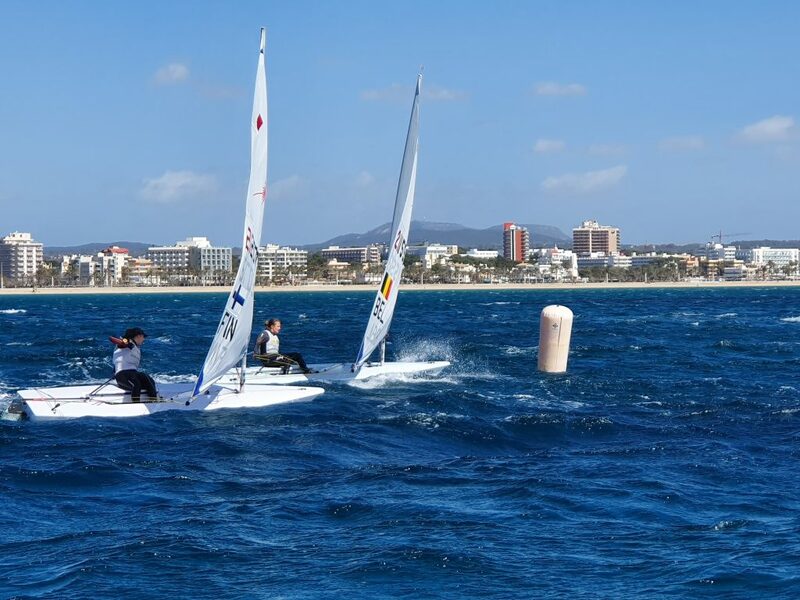 For reaching, it is somewhere in between: on a broad reach (close to a run) we are looking for maximum power, whereas on a tight reach (close to a close-hauled course) we need to lose lots of power. To close power we are using our sail controls: kicker, downhaul, and outhaul. In the Radial we need to rig the downhaul on one side of the boom, so that we can pull the cringle down alongside it. For the Standard, we will often put an additional block compared to the Radial and 4.7, to make it easier to pull down the required amount. The outhaul with a new sail has the sail touching the boom, but with an old training sail we may pull it even tighter, so we get a hard line across the bottom of the sail. Finally, the kicker may go to maximum so the blocks move in and out and not up and down when we sheet (remember we have to sheet out a lot in strong winds). The exception to this is when it becomes really extreme, perhaps 30 knots plus, and we start letting it off again to make the boat easier to sail and to stop the boom from hitting the water, which could cause the boat to “trip over it.” If it got close to 40 knots maybe you have almost no kicker on at all! The other issue, apart from going fast, is simply getting around the race course. 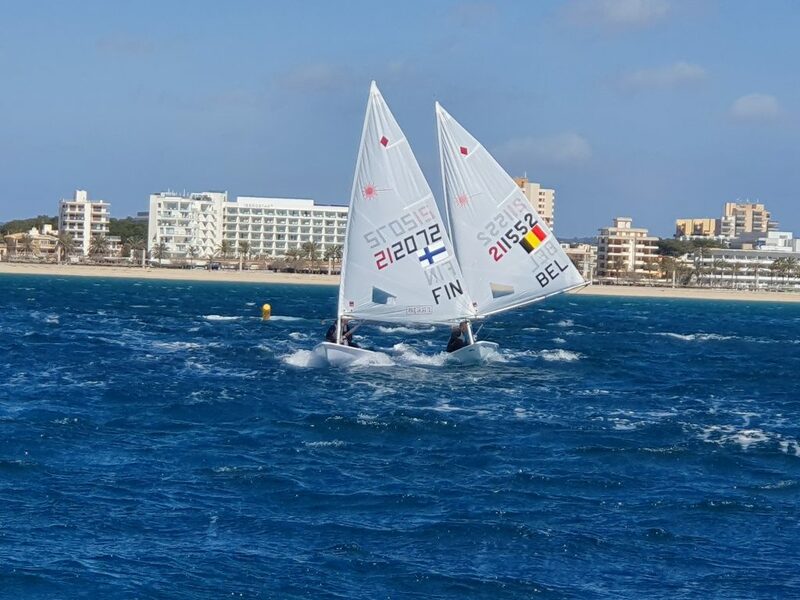 Remember it is much faster to have the mast in the air and the foils in the water (rather than the other way around), and a huge amount of hard work can be lost by a capsize. 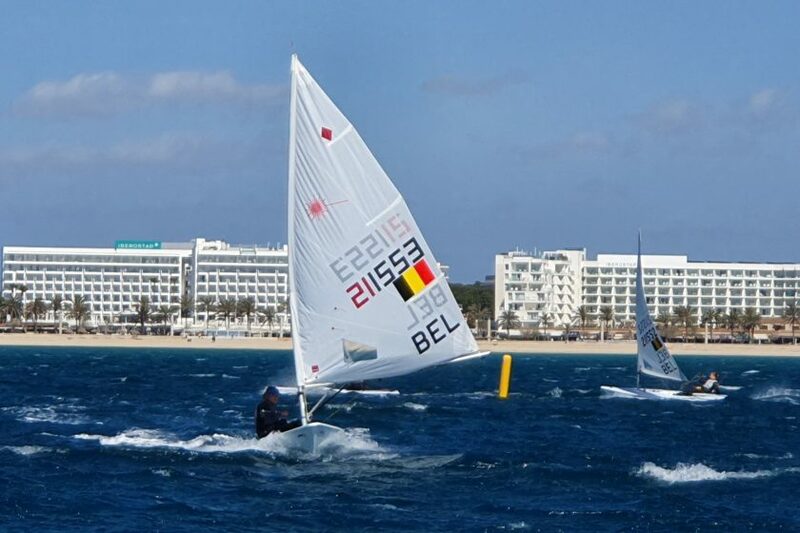 Therefore, short-course racing practice is a must to improve boat handling. Get the tack and gybe in, along with head-ups, bear-aways, and mark roundings. Adjusting the sail controls is key (kicker off and main sheet off to bear away, downhaul on and centreboard down before the leeward mark) and practice makes perfect, or at least a lot better than it was before! Jon’s book Coach Yourself to Win contains lots more top tips for all conditions and is available from all good book sellers!